New quickie from my work's sketch-jam. 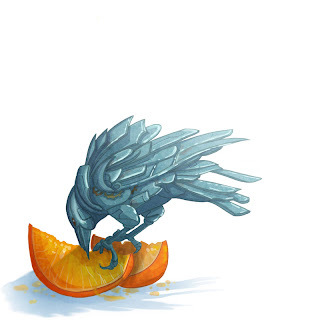 The topic was 'Orange & Mechanical.' Just off 'n on over the course of an hour. Sorry for not having anything more complete these days; been a bit busy, but hopefully I can get myself together for some new inspiration with these sketch-exercises! I joined a sketch-blog at work. This is my entry for the theme, 'Battle Arena.' ...somehow my first thought was the battle arena should take place in the bedroom.... ah well. Photoshop, done in in about 1-2 hours on/off.